LONDON--(BUSINESS WIRE)--Technavio has announced the release of their research report on the global aneurysm coiling and embolization devices market for the forecast period 2019-2023. This global aneurysm coiling and embolization devices market analysis report segments the market by product (embolization coils, balloon, and stent-assisted coils, access and delivery devices, aneurysm clips, and flow diversion devices) and geography (Asia, Europe, North America, and ROW). “The geriatric population in the North American region is at a high risk of developing IAs, which increases the demand for aneurysm coiling and embolization devices in the region. Furthermore, the strong presence of established vendors, increased healthcare expenditure, and the increasing presence of IAs and related risk factors in the region will also drive market growth in North America. The APAC region will witness faster growth during the forecast period. The high unmet demand for quality healthcare and increasing government initiatives to improve the healthcare infrastructure in the region will drive market growth during the forecast period,” says an analyst at Technavio. 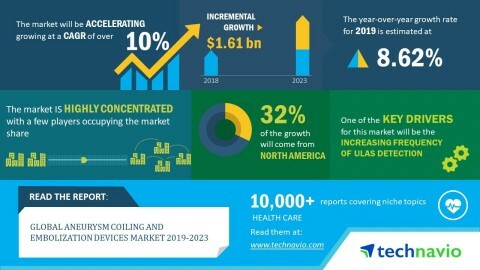 Technavio has announced the release of their research report on the global aneurysm coiling and embolization devices market during 2019-2023.